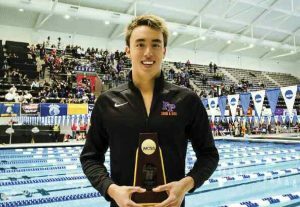 Lukas Menkhoff ’21 swims a winding path from Singapore to Pomona College to an NCAA Championship. The line at the bottom of the pool is always straight, but it has taken Lukas Ming Menkhoff ’21 on a winding path around the world. The 6-foot-4 swimmer from Singapore has competed in Beijing, Berlin, Stockholm, Dubai and Moscow on his dripping-wet international tour. 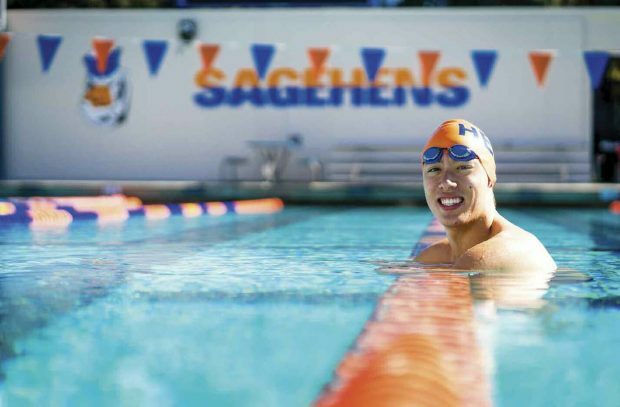 Indianapolis might not have the same ring, but the first-year swimmer made Pomona-Pitzer history there in March, becoming the first men’s swimmer in Sagehen history to win an individual NCAA title when he claimed the 100-yard breaststroke at the NCAA Division III Swimming and Diving Championships. Pomona-Pitzer claimed its first Southern California Intercollegiate Athletic Conference (SCIAC) All-Sports Trophy in 26 years last spring, taking the men’s trophy after winning four SCIAC championships. Read more Sagehens Claim All-Sports Trophy for Men’s Teams. The Pomona-Pitzer men’s team finished eighth overall and the women were ninth, marking the first time both teams have finished in the top 10 in the same season. His time of 53.39 also shattered the old Pomona-Pitzer record and earned him first-team All-American honors. Menkhoff also combined with Mark Hallman ’18, Samuel To ’18 and Ryan Drover ’19 to take third in the 400 freestyle relay in 2:59.08, a Pomona-Pitzer record, and Menkhoff finished ninth in the 100 freestyle in 44.22. By the time his record-breaking race began, Menkhoff had already competed in nine other races over the course of three days, and he was exhausted. During the race, he refrained from looking left or right—“By looking left, you lose like one-hundredth of a second,” he explains—so he didn’t know he’d won until he looked up at the scoreboard. Menkhoff hardly could have taken a more circuitous route to Pomona College. Already 22 years old as a first-year student, he completed Singapore’s mandatory military service before beginning his college career. He also spent a year focused almost entirely on training with the national team between high school and the military. His arrival at Pomona-Pitzer added a new level of international experience to the program this season. Menkhoff has swum in 14 FINA Swimming World Cups and almost made the prestigious Commonwealth Games team. Singapore’s small population gave him opportunities he wouldn’t have had as an American. “For me, it was a true privilege to be able to represent Singapore and swim on the world stage with Olympians and world-record holders, train alongside and converse with them, learn from them and even dine with them,” says Menkhoff, whose races for the national team as a teenager were sometimes televised. After making Singapore’s national team at 14, Menkhoff had the opportunity at a young age to mingle with some of swimming’s stars, including Ian Thorpe and Michael Phelps. He also had a few Phelps moments while training at the North Baltimore Aquatic Club, Phelps’ home club, for several weeks one summer as a teenager. Phelps approached him on the pool deck, complimenting Menkhoff’s freestyle stroke as “so long and smooth” and comparing it to Thorpe’s, with the whole interaction captured on video. “So that was a surreal moment, but he also imparted a lot of great advice,” Menkhoff says, remembering how Phelps gave him some technique tips, told him never to quit and to always swim from the heart. “Obviously I was dumbfounded by that whole interaction, but you realize that these swimming idols of yours are human beings and you’re able to converse at the same level as anyone else,” Menkhoff says. A year later, Menkhoff was swimming in a World Cup meet in Singapore when Thorpe, the Australian Olympian, came out of retirement. “Same heat, four lanes down,” Menkhoff says. Menkhoff knew mandatory military service awaited six months after high school, but scheduled an additional six-month deferment. Menkhoff researched and communicated with dozens of universities. Yet Pomona College was the first he visited in the U.S., and Gowdy the first coach he met with. He considered Division I programs before learning his post-high school competitions would cost him a year of eligibility, and ultimately circled back to where he began with that first chat in Gowdy’s office. Despite all his international experience, Menkhoff also benefitted from the presence of Hallman and To, two seniors who competed alongside him in the NCAA meet. “In a lot of ways, Lukas is good for them; in a lot of ways, they’re very good for him,” Gowdy says. For Menkhoff, it would seem, this is just the beginning.